Purpose: In this tutorial we will learn how to perform a time-dependent density-functional (TDDFT) calculation using different xc-kernels. Two examples will be proposed: One for the BSE derived xc kernel and other for the LRC kernel. As a test case, the optical spectrum of LiF will be studied. Before starting, be sure that relevant environment variables are already defined as specified in How to set environment variables for tutorials scripts. Important note: All input parameters that will appear will be given in atomic units! As a preliminary step for this excited-state calculation, a ground-state calculation will be performed. In this tutorial we consider as an example LiF. Create a directory named LiF_TDDFT-BSE-kernel and move into it. Inside the GS sub-directory we create the input file for LiF. In the structure element we include the lattice parameter and basis vectors of LiF, which has a rock-salt cubic lattice, as well as the positions of the Li and F atoms. In the groundstate element, we include a 10$\times$10$\times$10 k-point mesh (ngridk) and a value of 14.0 for gmaxvr. This value, which is larger than the default, is needed in view of the excited-state calculation (for details on this we refer to Excited States from BSE). N. B.: Do not forget to replace in the input.xml the string "$EXCITINGROOT" by the actual value of the environment variable $EXCITINGROOT. Start now the ground-state SCF calculation and check if it finishes gracefully. In case of a successful run the files STATE.OUT and EFERMI.OUT should be present in the directory. These two files are needed as a starting point for the excited-state calculation. 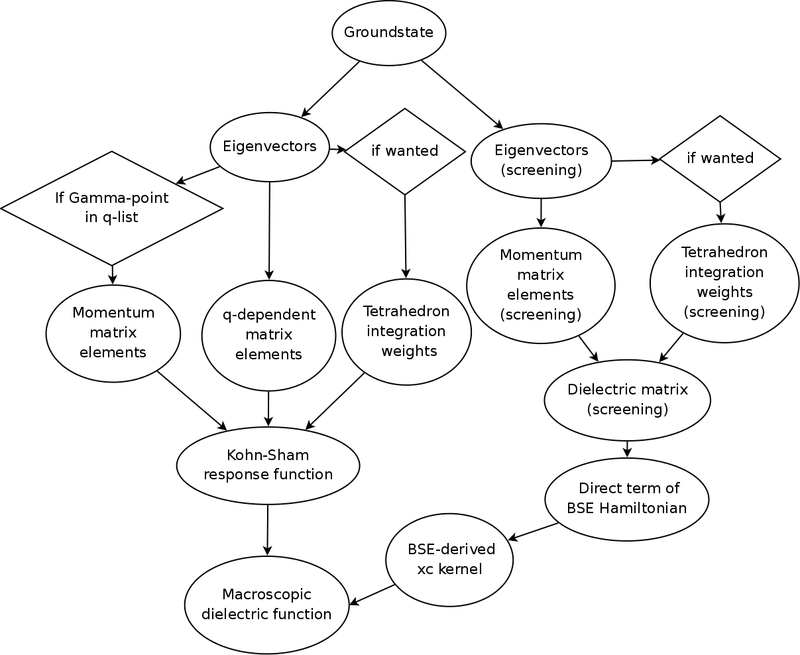 The work-flow of the algorithm is a combination of the TDDFT linear response calculation (see Excited states from TDDFT) and the calculation of the direct term of the BSE Hamiltonian, which is then used to set up a MBPT-derived kernel in first order. This kernel then enters the Dyson equation for the response function in the last stage of the TDDFT formalism. There is a large literature dealing with the inclusion of many-body effects into TDDFT kernels, in order to correctly reproduce excitonic features (for further details we refer the seminal review ORR-2002). In the following we will present two examples related to two different approaches. In the first one we will present a TDDFT calculation of the optical spectrum of LiF performed with a xc kernel derived from the solution of the Bethe-Sapeter equation (BSE). In the second part of the tutorial we will deal with the so-called long-range correction (LRC) kernel. In the example treating the BSE-derived xc kernel, the scheme proposed in MDR-2003 was adopted. In this approach, a nonlocal exchange-correlation functional is derived by imposing TDDFT to reproduce the many-body diagrammatic expansion of the Bethe-Salpeter polarization function. In this way, it is shown that the TDDFT kernel is able to capture the excitonic features in solids, otherwise missing in simpler approximation for the kernel. For further details about the implementation in the code, see SAD-2009. The values of $\alpha$ and $\beta$ are also material dependent and have to be tuned in order to correctly reproduce the experimental data for the excitons. For further details about the model we refer to the original paper BOT-2005. This block is very similar to the one presented in Excited States from BSE, to which we refer for an exhaustive description of the input attributes. In the following, we discuss only the relevant parameters for the TDDFT calculation with a BSE-derived kernel. The bse element must be specified to generate the kernel. Once the run is completed (it should take a few minutes), we can analyze the results. As in any TDDFT calculation, a number of output files are created (see also Excited States from TDDFT for additional details). 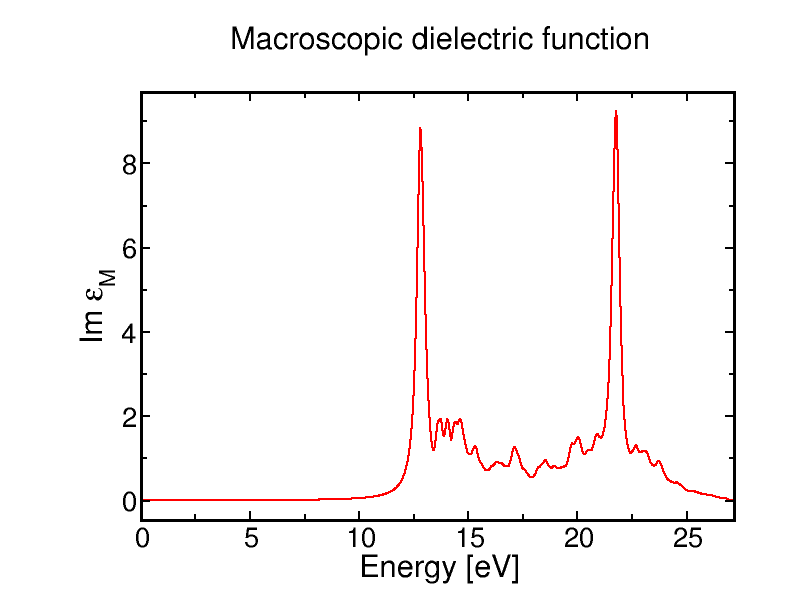 Here we are interested in the files named EPSILON_NAR_FXCMB1_OCYY_QMT001.OUT (YY = 11, 22, and 33) and specifically in the imaginary part of the macroscopic dielectric function, corresponding to the optical absorption spectrum. The main features of the optical spectrum are clearly visible in the graph. The intense excitonic peak at about 13 eV dominates the low energy part of the spectrum and another strong peak is found above 20 eV. This result is in agreement with the spectrum obtained by solving the BSE equation (see Excited States from BSE). For further comparison with the literature, we refer to MDR-2003. In the plot above, the strong excitonic peak at about 12.5 eV characterizing the spectrum of LiF is correctly reproduced by the TDDFT calculation with the static LRC kernel. 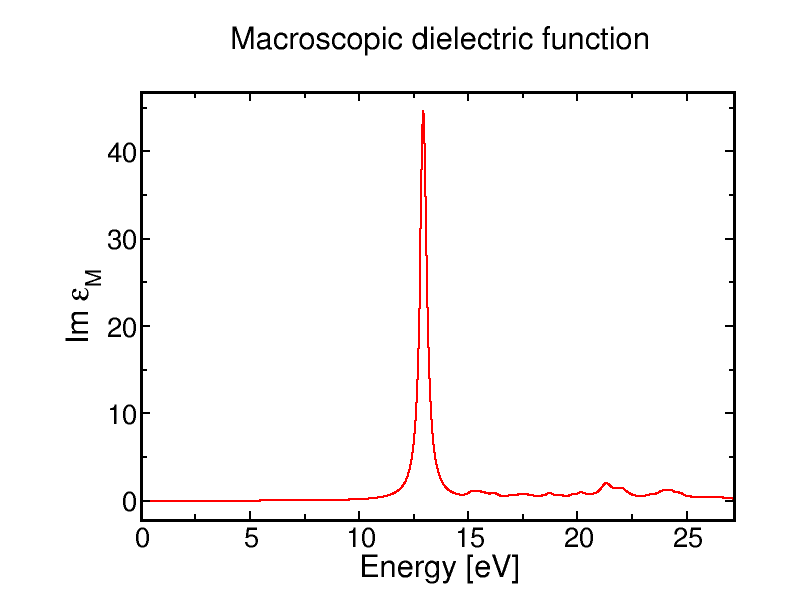 Compared to the result obtained with the BSE-derived kernel the main differences appear in the higher energy region of the spectrum, above 20 eV. 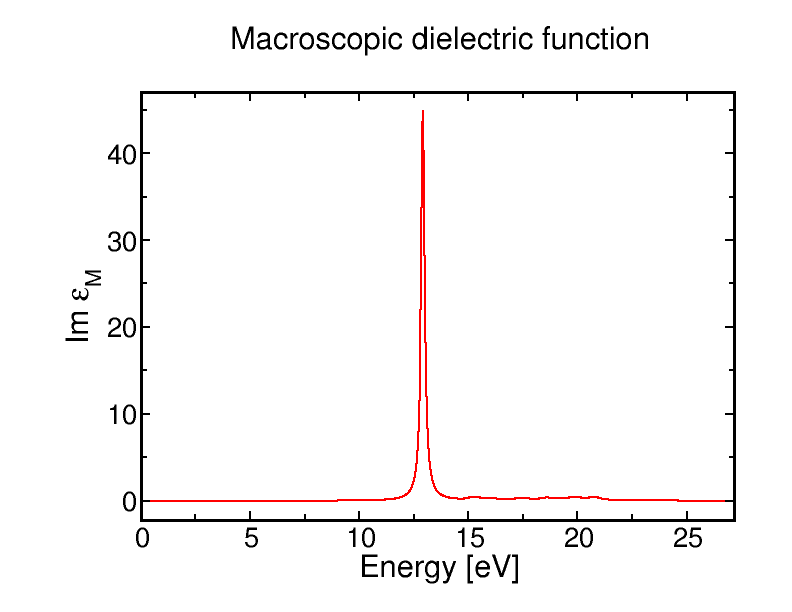 However, the purpose to correctly reproduce the intense bound exciton of LiF is fulfilled. The first intense excitonic peak is again well reproduced by the LRC kernel. If you have already done the tutorial Excited states from TDDFT, calculate the optical absorption spectrum for LiF using RPA and ALDA kernels. What happens to the excitonic peak? Decrease the parameter alphalrc in the calculation with the static LRC kernel and check what happens to the excitonic peak. Compare your results with the onset of the spectrum obtained from the RPA calculation. Tune the parameters alphalrcdyn and betalrcdyn, following the rule of a thumb suggested above. What happens to the spectrum? ORR-2002: G. Onida, L. Reining, and A. Rubio, Rev. Mod. Phys. 74, 601 (2002). MDR-2003: A. Marini, R. Del Sole, and A. Rubio, Phys. Rev. Lett. 91, 256402 (2003). SAD-2009: S. Sagmeister and C. Ambrosch-Draxl, Phys. Chem. Chem. Phys. 11, 4451 (2009). REI-2002: L. Reining, V. Olevano, A. Rubio, and G. Onida Phys. Rev. Lett. 88, 066404 (2002). BOT-2005: S. Botti, A. Fourreau, F. Nguyen, Y.-O. Renault, F. Sottile, and L. Reining, Phys. Rev. B 72, 125203 (2005).